Cardamom is the world’s third-most expensive spice, surpassed in price per weight only by vanilla and saffron. 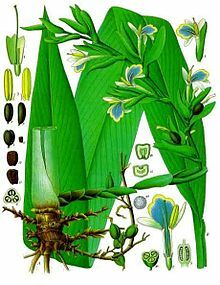 The word “cardamom” is derived from the Latin cardamomum, which is the Latinisation of the Greek καρδάμωμον (kardamomon), a compound of κάρδαμον (kardamon), “cress“ + ἄμωμον (amomon), which was probably the name for a kind of Indian spice plant. The earliest attested form of the word κάρδαμον signifying “cress” is the Mycenaean Greek ka-da-mi-ja, written in Linear B syllabic script, in the list of flavourings on the “Spice” tablets found among palace archives in the House of the Sphinxes in Mycenae. The modern genus name Elettaria is derived from the local name. The root ēlam is attested in all Dravidian languages viz. Kannada elakki (ಏಲಕ್ಕಿ), Telugu yelakulu (యేలకులు), Tamil elakkai (ஏலக்காய்) and elakka (ഏലക്കായ്) in Malayalam. The second element kai means “seed” or “fruit”. The Malabar region had historical trade connections and was a prominent area of cardamom cultivation. A related root is also present in Hindi ilaychi (इलायची), Bengali ælachi (এলাচি), Sylheti elasi (ꠄꠟꠣꠌꠤ) and Punjabi ilaichi (ਇਲੈਚ) “green cardamom”. In Sindhi, it is called photta. In standard Afghan Pashto, it is called Hel. In Sanskrit, it was known as ela (एला) or ellka (एल्ल्का). 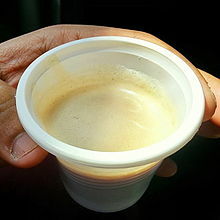 In Marathi, it is commonly known as velchi (वेलची) or veldoda (वेलदोडा). In Sri Lanka, the plant is known as enasal in the Sinhala language. In Asia, both types of cardamom are widely used in both sweet and savory dishes, particularly in the south. Both are frequent components in spice mixes, such as Indian and Nepali masalas and Thai curry pastes. Green cardamom is often used in traditional Indian sweets and in masala chai (spiced tea). Both are also often used as a garnish in basmati rice and other dishes. 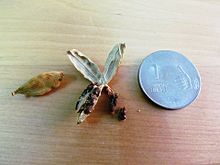 Individual seeds are sometimes chewed and used in much the same way as chewing gum. It is used by confectionery giant Wrigley; its Eclipse Breeze Exotic Mint packaging indicates the product contains “cardamom to neutralize the toughest breath odors”. It is also included in aromatic bitters, gin, and herbal teas. ^ a b Shenoy Karun, Kerala cardamom trying to fight off its Guatemalan cousin”, The Times of India, 21 April 2014; accessed 25 July 23014. ^ “cardamom – translation – English-Marathi Dictionary – Glosbe”. Glosbe. ^ Bhide, Monica. “Queen of Spices”, Saveur, 8 March 2010. Retrieved on 4 December 2014. ^ Katzer, Gernot. “Spice Pages: Cardamom Seeds (Elettaria cardamomum)”. gernot-katzers-spice-pages.com. Retrieved 2017-04-04. ^ “The Uses of Cardamom”. Garden Guides. 2017-09-21. Retrieved 2018-05-29. ^ “Is Cardamom a Spice?”. The Spruce Eats. Retrieved 2019-01-29. ^ “Buy Fine Green Cardamom Pods Pack Of 250gm Online form Shree.deals”. shree.deals. Retrieved 2019-01-29. ^ a b Álvarez, Lorena; Gudiel, Vernick (14 February 2008). “Cardamom prices leads to a re-emergence of the green gold”. El Periodico (in Spanish). ^ Batres, Alexis (6 August 2012). “Looking for new markets”. El Periodico (in Spanish). Guatemala. Archived from the original on 19 April 2014. ^ Aubertine, C. 2004, Cardamom (Amomum spp.) in Lao PDR: the hazardous future of an agroforest system product, in ‘Forest products, livelihoods and conservation: case studies of non-timber forest products systems vol. 1-Asia, Center for International Forestry Research. Bogor, Indonesia. Aubertine, C. 2004, Cardamom (Amomum spp.) in Lao PDR: the hazardous future of an agroforest system product, in ‘Forest products, livelihoods and conservation: case studies of non-timber forest products systems vol. 1-Asia, Center for International Forestry Research. Bogor, Indonesia.